The temperature is dropping and that means one of the most precious commodities in Northeast Ohio is HEAT! Don't let your guests get cold or your event not be as successful because of a lack of a comfortable environment. To help that cause we have L.B. White furnaces. 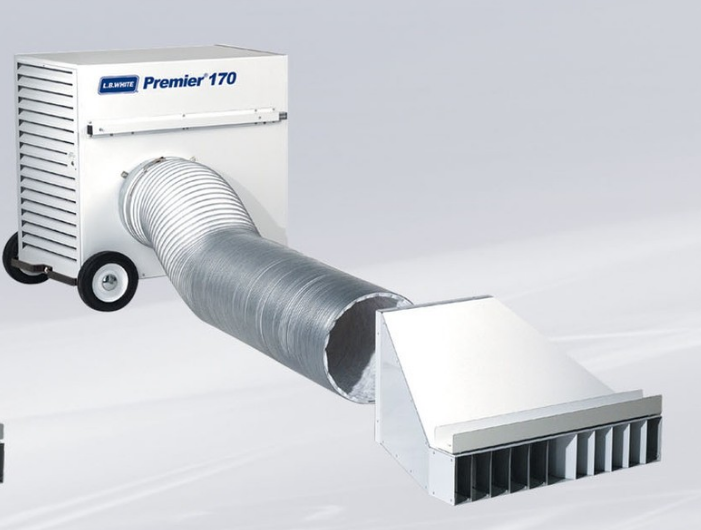 The furnace is a forced air unit available in 170K BTU. It is is powered by a standard 110v outlet to run the fan and 100lb Propane tank to fuel the heat source. The 100lb propane tank will give you approximately 8 hours of run time for the furnace. Added features of the furnace is its ducting abilities and thermostat. Unlike torpedo heaters that are either on or off, the furnace can have a thermostat attached to it and that thermostat then placed in the heated room. This allows the temperature of the space to be controlled much like the temperature in your home. The ability to duct the unit also helps enhance the event. The furnace does not need to be placed in the room and can be put as far as 10' away from a building or tent with duct work running to the desired location. This helps cut down on noise pollution coming from the blower motor. Next time you need to make your event a little warmer, a warehouse a little more inhabitable, or the garage a little more tolerable for that winter project, give us a call. We have a fleet of furnaces ready and capable!